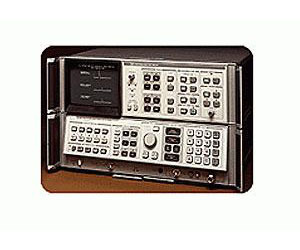 The Agilent 8566B, 8567A, and 8568B are high-performance spectrum analyzers for bench and ATE system use. The Agilent 8566B has the highest performance of the three, with a frequency range from 100 Hz to 22 GHz that can be extended to 325 GHz using external mixers. The Agilent 8567A and 8568B are RF spectrum analyzers with frequency coverage to 1500 MHz. The exceptional frequency stability of the Agilent 8566B and the Agilent 8568B makes it possible to make measurements with a 10 Hz resolution bandwidth. This narrow resolution bandwidth yields sensitivities to -135 dBm in both instruments. Excellent frequency stability, sensitivity, and frequency-reference accuracy combine to allow very accurate measurement of small signals in the presence of large ones. For applications that do not require the high performance of the Agilent 8566B, the Agilent 8567A offers the same speed, versatility, and automatic operation capability at a lower price. Resolution bandwidths as narrow as 1 kHz yield sensitivities as low as-115 dBm. These spectrum analyzers fit into many applications, such as EMC testing, broadband signal surveillance, and component stimulus-response testing.